Another Long Walk: Day 9: The Great Rubber Duck Race! September 1: I woke up at my usual time, in no particular rush since the post office didn't open until 10:00 on Saturdays. I ate a wonderful breakfast at the hostel, took a last, hot shower and packed up. 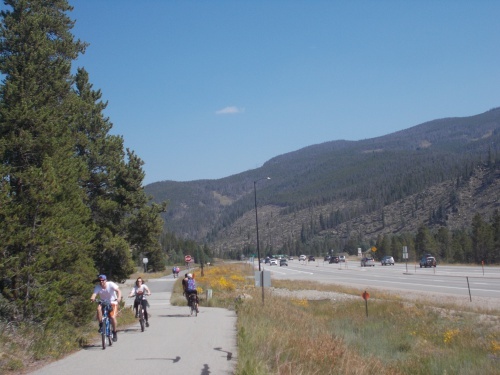 My next stop would be Salida, eight or nine days away. Just as I did a last check around the bunk bed, I found my missing Polish flag. Yes! I had searched the side of the bed twice before without seeing the flag and I still don't know where it came from, but I was glad to have found it. It would be hard to find a replacement for a Polish flag around these parts. It also occurred to me that it was a pretty simple flag. I could maybe sew one myself if needed. But for now, it wasn't needed! I left the hostel, arriving at the post office when it opened and mailed my laptop and a few other miscellaneous items ahead to Salida. Walking through Breckenridge to the bus stop was a little crazy, though, because I had forgotten that today was the Great Rubber Duck Race! 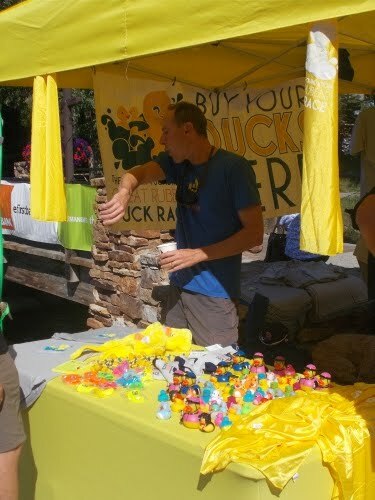 Rubber ducks were everywhere! Giant rubber ducks, booths selling rubber ducks, people walking around dressed like rubber ducks.... rubber ducks everywhere! It was amusing to watch and it tempted me to hang around town to watch an actual rubber duck race, but I had miles to get done and had no idea when the race(s) would start. Nope, I soaked in the festivities for a bit, but continued on to the bus stop. There, I met another thru-hiker: James, from New Orleans. I had actually met him briefly on my second day on the trail and talked for a minute or two. He had taken a few zero days on the trail, sick from altitude sickness, and I didn't expect to see him again. My second, unplanned zero day in Breckenridge gave him a chance to catch up, though. Back at the trail, we started hiking into the mountains again. 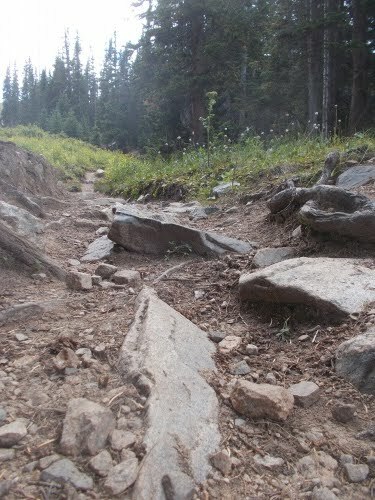 The trail climbed almost constantly and steadily about 3,000 feet up to the highest pass so far on the trail, peaking at about 12,500 feet above sea level. 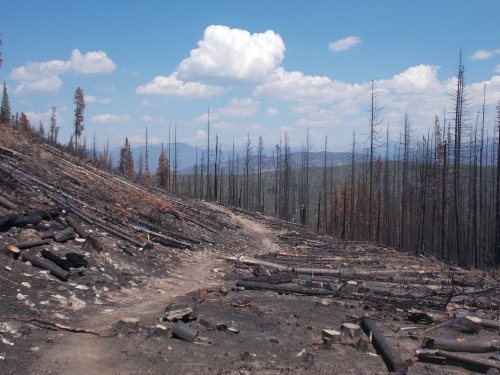 The trail started moderately steep, then led into a small area that had burned in a wildfire a month or two earlier. 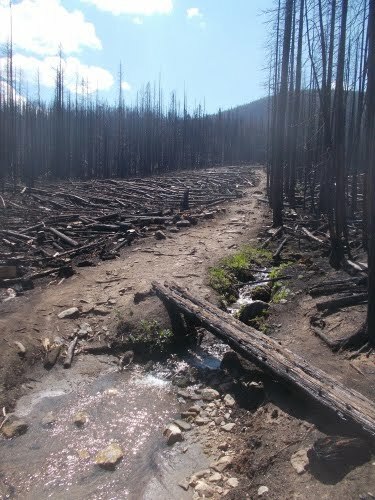 The burn scars were still fresh, but the trail was now open to hikers. The trail seemed to grow increasingly steep the higher and higher it ascended, an exhausting climb even without being loaded down with a 50-pound pack. My pace slowed to a crawl. Step. Step. Step. I reached a clearing where I caught up with another hiker--Gabe, who I had met at the hostel and had left the hostel two days earlier. I was stunned to see him so soon. I did in an afternoon what took him two days to complete?! He explained that the day he left, it poured buckets of rain, then he took a zero day on the trail yesterday to dry out. I remembered the heavy rain that fell in Breckenridge on my first zero day and remembered thinking how glad I was to be indoors and completely indifferent to it. Obviously, Gabe had been struggling during that time. He also said that he was nearly at out of water because the climb up had been so much more strenuous than he expected. The problem with him being almost out of water, however, was that the next water on the trail was many miles away on the other side of the pass. I was a little concerned about the safety of Gabe. He was heavily overweight as it was and seemed to be struggling on the trail, unable to handle the rain and running out of water. He told me earlier than he hiked the PCT so I thought he knew what he was doing, but I was having second thoughts about that assessment. I tried to remember the exact words he told me. 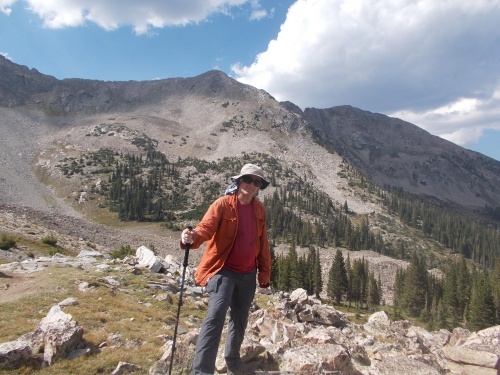 Did he actually say he thru-hiked the PCT, or just hiked it? He said he hiked it like he was a thru-hiker who had completed it, but maybe he just said he "hiked" it. 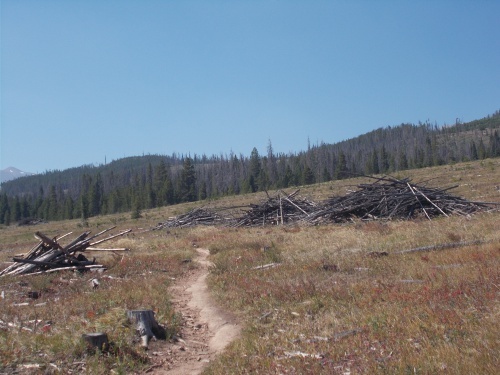 Which could mean anything from a one-mile jaunt to a thru-hike? I had picked up a lot of water knowing the severe lack of water for the next several miles, probably more than I really needed. I always liked erring on the side of caution and having too much water. Better to have too much water than not enough! So I offered Gabe about a liter of my water which he happily accepted. I'd be fine. Perhaps I wouldn't be guzzling down buckets of water like I otherwise might have done, but I wasn't going to go thirsty either. And I just dumped a couple of pounds of water that I no longer had to carry. 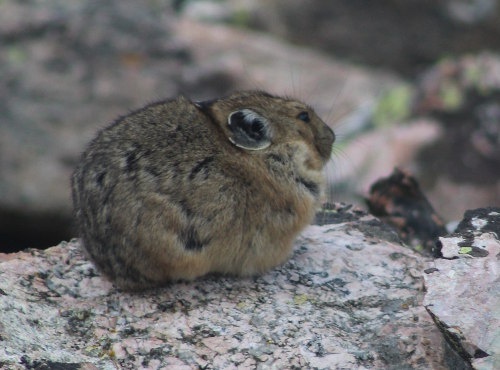 While chatting with Gabe, pikas jumped around in the rocks everywhere and I pulled out my camera, installed the zoom lens, then spent about 10 minutes stalking pikas trying to get that perfect photo of one. I got quite a few very nice photos of them, pleased again that I had that camera with me even though it was annoyingly heavy and bulky. James caught up and took a short rest while I was chasing pikas and introduced him to Gabe. Gabe had left the hostel before James arrived so they had never met before. We continued on our way, and I took the lead because I knew I hiked faster than both of them. Before long, I could look back and see James taking a substantial lead behind Gabe. I hoped Gabe would be okay, but I was a little worried that he barely had a liter of water. He drank the one liter he carried in less than a mile from the last water source, and now he had the one liter I gave him--but he had four or five miles to go until the next water source. 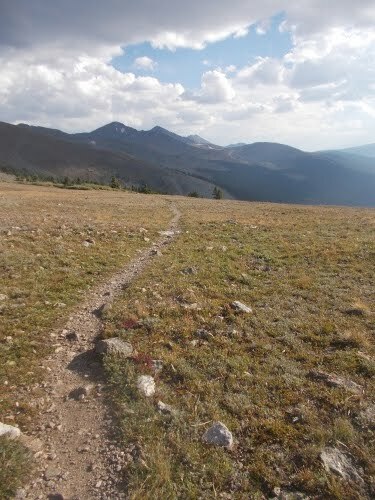 The trail continued climbing, eventually peaking at about 12,500 feet overlooking the city of Breckenridge. I wondered how the Great Rubber Duck Race was going. I took a snack and rest break at the top with its commanding views, and James caught up again maybe 20 minutes later. Gabe was still nowhere in sight, and we both hoped he was doing okay. James paused to take a break and make a phone call, and I continued back down the other side of the ridge towards the Copper Mountain ski resort. I could see the ski resort far below, with Interstate 70 snaking by. It looked like a heck of a long way down, though, and it was. Heading downhill, my speed picked up dramatically and I often had to slow down and make sure I didn't slip or hurt myself on the steep descent. Near dusk, I stopped at a campsite near a creek. I passed several small creeks the last mile or so before then. A couple with two loud, aggressive dogs camped nearby, and I found a place to camp safely away from them. When James passed by about 20 minutes later, I told him that he was more than welcome to join me in camp. It had been a long day and I knew he was tired. I also suspected that he also had no interest camping next to the aggressive dogs. He had planned to hike further but took me up on the offer due to being so tired and spent some time guessing where Gabe was. Did he make it over the pass? We both suspected he'd probably stop at the very first water source he reached. There was a campsite near it--a nice campsite too! At the very least, he had to reach water since I had left him with just one liter and he'd probably finish that before reaching the pass and would be desperate for water. I was a little concerned about Gabe, but not super worried. I knew he had a cell phone and if he really got himself into trouble, at least he could call for help. 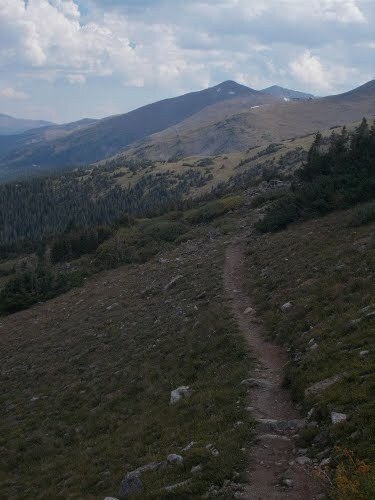 This section of trail had almost universal cell phone coverage since we were so close to Breckenridge on one side of the ridge and Copper Mountain on the other. Then we chatted about other things. James complained about how cold it was in the morning. He was from New Orleans, after all, and wasn't used to the cold weather. I found this amusing. "You know it's going to get a lot colder before you reach the end of the trail, right?" 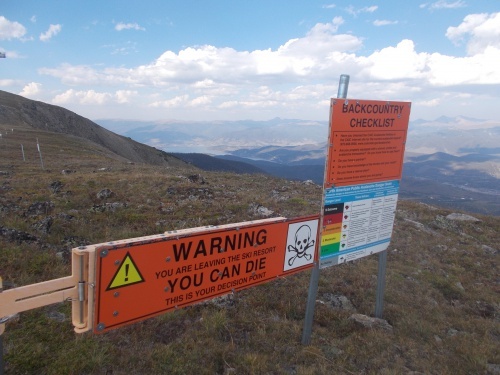 It was early September now, and they say thru-hikers should try to finish the trail before the end of September if you want to avoid severe winter weather. You might still get a dumping of snow even in September, but it'll be getting colder--snow or no snow. Long after sunset, our conversation started petering out and we were settling in for the night when a hiker with a headlamp passed by on the trail. I said, "Hi!" and we were a little surprised to discover it was Gabe. He had made it! Long after sunset, and he was cursing about how much he hated night hiking. I wanted to ask, "Then why are you doing it?" but I bit my tongue. He passed several campsites before this one, though, and could have stopped at any of them. He didn't have to be hiking right now. He also complained that he ran out of water several miles back. The last mile or two the trail passed several small streams, though--there's no reason he shouldn't have plenty of water at this point. I invited Gabe down to camp with us. It would be a little crowded, but Gabe looked exhausted and didn't seem like he was thinking clearly--hiking in the dark without any water despite having plenty of places to camp and passing by several streams. But Gabe turned us down, for some inconceivable reason wanting to push on. We wished him luck and were left dumbfounded. Gabe seemed to really be hurting badly and struggling. That in itself didn't surprise us, but why wouldn't he stop? Why wouldn't he pick up water if he was so thirsty and out of water? Why did he continue hiking in the dark if he didn't like night hiking? We had answers to none of these questions, but I had a feeling that Gabe might take a zero day tomorrow to give himself a rest. And shortly after that, James and I headed off to sleep for the night. 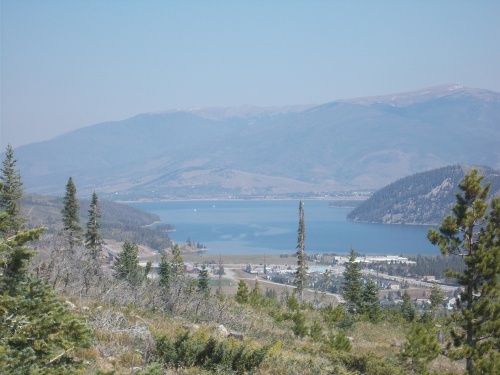 Looking back towards Frisco and Dillon Reservoir. 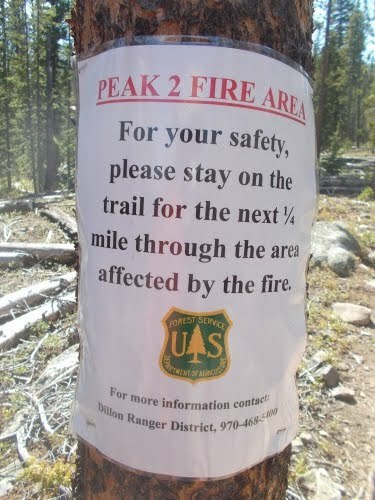 This fire closed the trail for a short while a month or two earlier. The trail had since re-opened, but they didn't want people wandering off trail where a dead tree might fall on them. 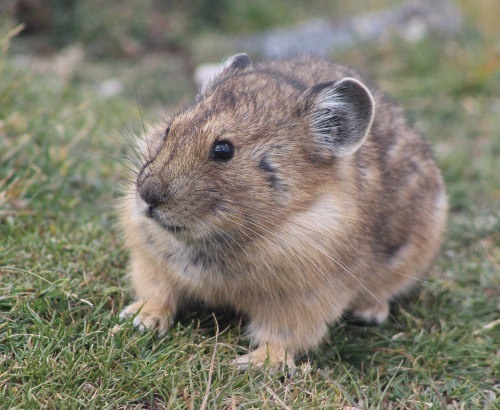 It's a pika!!! We watched maybe a dozen of them frolicking in the rocks! 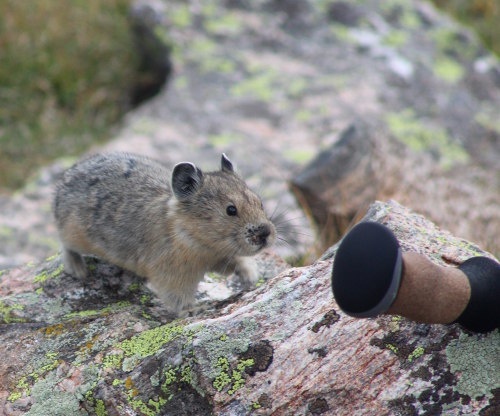 This one was getting curious about my trekking pole. He sniffed at it, knocking it off the rock which scared him off. We can DIE?! Please, say it isn't so! 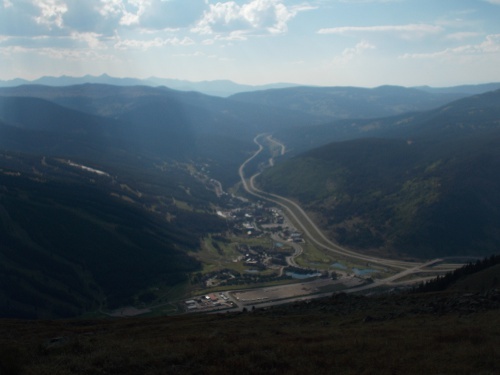 Copper Mountain ski resort is located on the other side of the ridge, with Interstate 70 snaking its way into the distance. 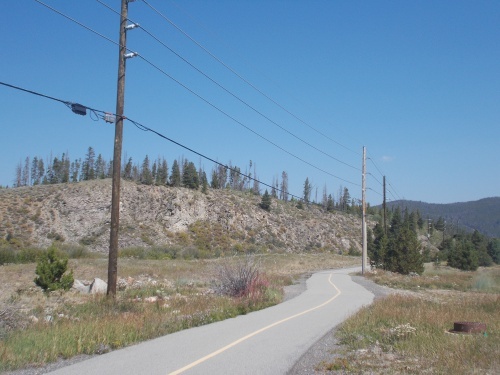 The trail would go through the woods just to the left of the resort, near the bottom of Copper Mountain.